My focus on this first flat card is the fun wedding can image. 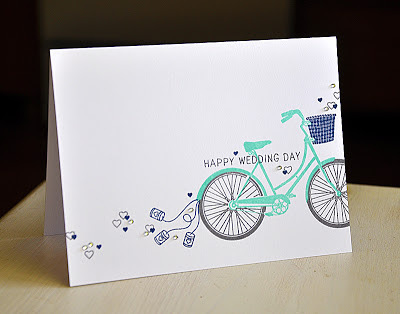 I began by stamping to two step bike... wheels in gray and bike in aqua. Here's A Tip: For a bit of interest, I created the look of movement by stamping a portion of the bike slightly off the edge of the card base. This unexpected detail takes this simple card and kicks it up a notch. The little additions you choose to add to this basic bike image are what make your project unique. 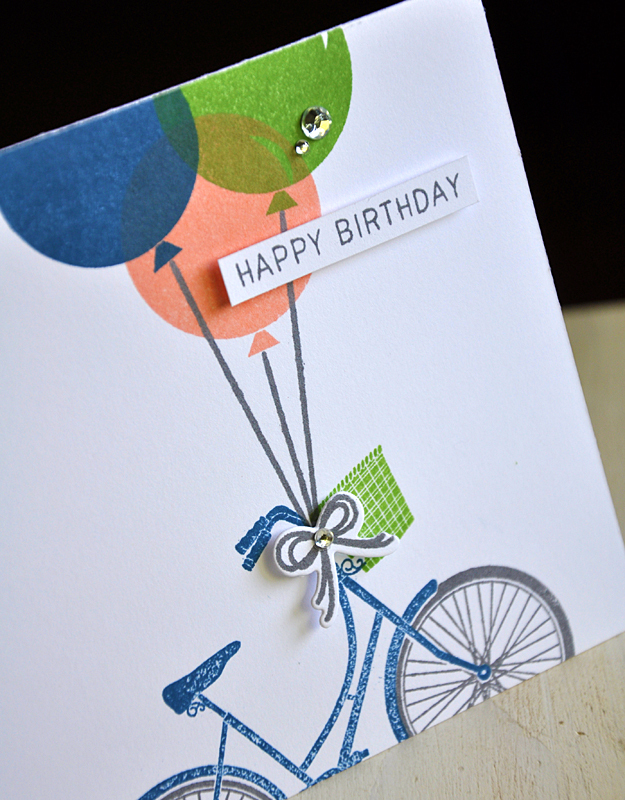 Up next, I've paired Pedal Pusher with the balloons and bow from Birthday Style. I knew I wanted to have the balloons carry the bike away. Working with a number of larger images was a little tricky to incorporate onto a small 4 1/4" x 5 1/2" card front. 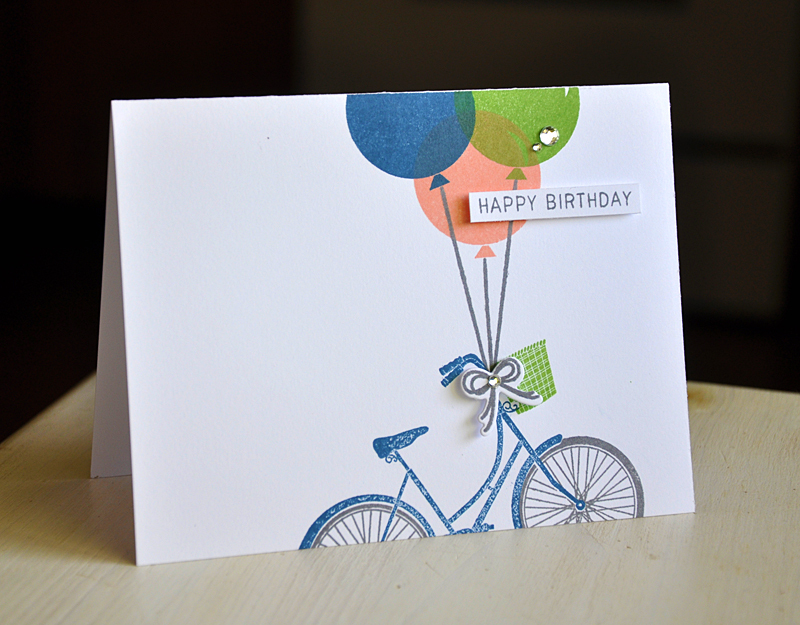 But by stamping both the balloons and bike over the edges I was able to achieve just that. I love the end results! Well, that concludes my look at Pedal Pusher. Just remember... this stamp sets will be available for purchase through Papertrey Ink, beginning May 15th. You are a genius. Who needs interactive when you can have such CAS goodness. The bike going "Up" is so incredibly Maile and so perfect. Love every card you make. Loving this stamp set. I really love how you 'played' with these stamps...such a fun idea to create movement in both of your cards! You are amazing!!! Gorgeous card! Love how different & beautiful made each card is! TFS! I was waiting to see how you were going to use those balloons. :) Genius. You did it again, Maile. The wedding card especially did it for me. So fun! I'm sold too! So cute. I like the cans trailing behind with the hearts and jewels. CAS is the way to go. Hawaiian shores with enchanted evening is a glorious combination. And I love how you made the bicycle float up and away. Thanks for adding your tips to the post. I knew today's tip about stamping an image off the page, but there have been others of which I wasn't aware. 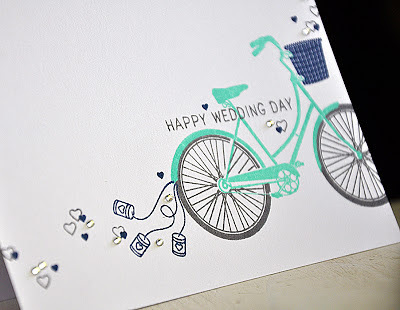 Such great CAS -- the way the wedding bike goes off into the future and the way the birthday bike looks like it's being lifted by the balloons -- your card compositions are always so great, and the extra thought you put into the placement just totally completes the message! I love the ballon effect with the bike. It reminds me of the video up. Love what you do with stamps. The different effects that you can get with one stamp. Love, love the balloons card. What an inspired idea, thank you. Yep, you've made me want this set, too. Love these cards. I think that first bike card is one of my fav cards of yours ever. So neat. I love it! And the colors. So gorgeous. I am seriously gonna have to get this set the next time I order.